Let’s talk about women, and more specifically, women in leadership positions at work. Current darlings in this category include Indra Nooyi (PepsiCo), Marissa Mayer (Yahoo), Virginia Rometty (IBM) and Sheryl Sandberg (Facebook).Closer to our shores include the likes of Tan Sri Dr Zeti Akhtar Aziz, governor of Bank Negara. But what’s the big deal really? We don’t see Steve Jobs mentioned because he was a male CEO, nor do we find lists of “Top 50 Male Entrepreneurs” on Mashable. If there’s a Ministry of Women, why is there no Ministry of Men? Why are scores of studies done to understand and encourage female participation and leadership in the workplace? What about the participation of men? Somehow, being female just seems to rack up more attention. The myriad of current initiatives can silently seem to scream “favouritism!” But when we peer beyond the apparent grand machineries (their effectiveness being another discussion altogether), the issue that feeds these initiatives becomes clearer. There is a startling under-representation of women in leadership positions around the world. Despite the almost one to one male to female ratio in the population (1.1:1 to be precise), there are far more male leaders than female ones. In Fortune 1000 companies, women hold just 4.2% of CEO positions. In Harvard Business Review’s 2013 list of 100 best performing CEOs globally (which we featured last week), only two are women. The numbers aren’t very encouraging on the Malaysian front either. McKinsey statistics show that a 57% of university graduates in Malaysia are female. 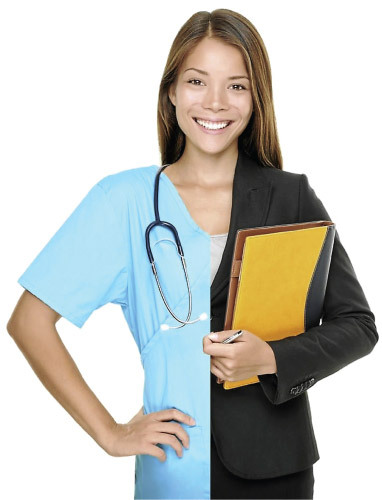 Women also account for 53% of entry level professionals in the country. Yet, representation dips dramatically as we look further up the seniority level of organisations. 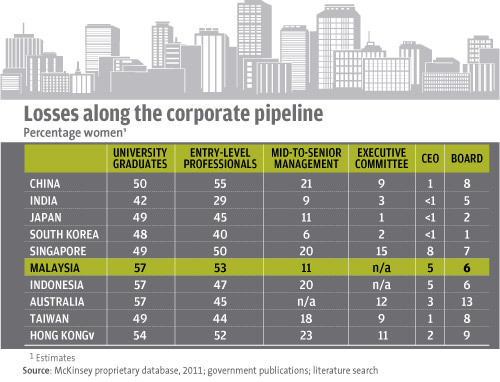 Only 5% of CEOs in Malaysia are women, and the representation of females on boards sits at a mere 6%. It’s almost like women perform incremental disappearing acts as we scale the career ladder, and this is seen all over the world. Countries like Australia have even poorer numbers to show, with women making up 57% of university graduates, but only 3% of CEOs. All these statistics still beg the question: What’s the problem? If women are under-represented at leadership levels, it’s just the way the cards of society have fallen. But in the context of companies, we are in a time where there are dire talent needs in organisations all around the world. With hot phrases like “the war for talent” and talks of the talent pool “drying up”, companies both want and need to tap into the unreached potential of the female talent pool. Women in leadership. It’s just good business. There’s no difference in leadership potential between women and men; making sure you can capture a better share of high-performing women is better for the organisation. There are implications for the country as a whole as well. McKinsey estimates that if the participation rate of women in the labour force in Malaysia increased from the current 47% to match Singapore or South Korea (60% and 55% respectively), it could potentially increase Malaysia’s gross domestic product or GDP by RM6bil to RM9bil. There are numerous factors informing the low representation of women in leadership positions. One core issue is women leaving the workforce. TalentCorp and ACCA’s Retaining Women in the Workforce 2013 report cites the main reasons for women leaving as raising a family, lack of work-life balance and to care for a family member. As Facebook’s Sheryl Sandberg points out in a popular 2010 TEDWomen talk entitledWhy We Have So Few Women Leaders, being at home is a choice every woman has a right to make. However, Sandberg raises another pertinent factor for the paltry number of women leaders. There are problems with the messaging that society gives to women about work and success, she says. It has to do with the curious relationship between women and career success. Successful women are not liked as much as successful men. For women to not just stay or return to the workplace, but also thrive at work, Sandberg says society’s message to successful women needs to be fixed. It’s not just about telling women that they can do “it”. I wish I could just go tell all the young women I work with, all these fabulous women, ‘Believe in yourself and negotiate for yourself. Own your own success,’” says Sandberg in the TED talk. “I wish I could tell that to my daughter. But it’s not that simple. Because what the data shows, above all else, is one thing – which is that success and likability are positively correlated for men and negatively correlated for women.” The Facebook COO goes on to illustrate this point using the example of Heidi Roizen, a venture capitalist at SOFTBANK Venture Capital and a former entrepreneur. Roizen, a Stanford University graduate and former Apple vice-president of worldwide developer relations, is known for her extensive personal and professional network. She has been so successful at leveraging her contacts for her benefit and success, that her approach to building networks became the topic of a Harvard Business School case study in 2000. In 2002, professor Frank Flynn presented Roizen’s case to his students at Columbia University. But with Harvard’s permission, he decided to modify the case to perform a social experiment. He changed Heidi’s name to Howard, and changed all pronouns to depict Roizen as a male. To half his class, he gave the case for Heidi Roizen. To the other half, Howard Roizen’s. Students were then asked to answer questions on their impression of Roizen. The results were remarkable. Even though the details of both Howard and Heidi’s case were the same, save for their name and gender, students were suspicious of Heidi. While both groups believed that Heidi and Howard were competent, Heidi’s group perceived her use of her contacts as selfish and thought she was in it for herself. They wouldn’t work for her nor hire her. Those who received Howard’s case, on the other hand, saw him as likeable, someone who made things happen and that they would work with. How does gender provoke such different responses? Here’s another example to chew on. In the 1970s, orchestras had a problem of having too few women. The percentage of females stood at a meagre 5%. To tackle the issue, they modified the audition process. They put a blind between the performer and the evaluating judges so that the judges could not see the performer. This simple change increased the odds of women making it past the first round of auditions by a whopping 50%. There was something that influenced the decision making of judges to demonstrate a bias in favour of males. Though judges wanted to hire the best musicians possible, the genders of people auditioning affected how they saw the quality of the performances. It has to do with gender stereotypes, explains Shelley Correll, professor of sociology at Stanford University in a video lecture entitled Creating a Level Playing Field. Gender stereotypes function as a cognitive shortcut in information processing. If you’re in a situation where you have a lot of information that you have to evaluate, it’s natural to look for shortcuts to take in navigating all that information. Unfortunately, gender stereotypes function as one of these shortcuts, and when they do so, they introduce error into our decision making.-Correll. There are also expectations for women to be warm and kind, and men to be action-oriented and assertive, she adds. So when a woman performs well in a traditional male type task, “this performance runs counter to what our stereotypical expectations would have led us to expect. As a result, we tend to scrutinise her performance as if we’re trying to understand how it is that she performed so well.” “When a man performs well, this is consistent with our expectations, so we don’t scrutinise his performance as carefully.” What happens is “the man ends up being judged by a more lenient standard than the woman. Our standards shift around depending on the gender of the person we’re evaluating,” says Correll. Are Females Held to A Higher Standard? In a study by the University of Wisconsin-Milwaukee in 1999, researchers sent out a job application to academic psychologists in universities throughout the United States. Some were sent under a male name, and others under a female name. Results showed that both male and female recipients were more likely to hire the male applicant over the female, in spite of their identical record. They saw the male applicant as having the “adequate teaching, research and service experience compared to the female applicant with an identical record”. Correll brings up another study where participants had to evaluate applications for the position of police chief. Two resumes were presented to them, one with more education and the other with more experience. Participants overwhelmingly favoured the one with more education, believing it to be more important. When a male name was put on the resume with higher education, and a female name on the one with more experience, they yielded the same result. They preferred the man because he had more education. When the names were swapped around, with the woman’s name now on the resume with more education, participants preferred the man because he had more experience. “Our stereotypes led to the shifting of the very criteria that was deemed important,” Correll comments. “Women are often aware that they face a higher hurdle. So what we often do is say we’re going to work harder, but that doesn’t even always work. Sometimes, in our effort to display our competence, we illicit negative reactions in terms of how likeable we are”. This leads to the “double line reaction” where women find it hard to be seen as both successful and likeable. 1. Educate on bias Teach people how stereotypes affect decision making so that they can scrutinise their own decision making. 2. Establish clear criteria Establish clear criteria so decisions can be made according to the criteria. If it was made clear that education takes precedence over experience, the police chief case would have brought about a different result. 3. Scrutinise the criteria Ensure the criteria is made up of the actual requirements to be successful on the job, and doesn’t include unnecessary add-ons. 4. Hold decision makers accountable When there is accountability and the need to explain your decision making, there will be less tendency to use stereotypes as a shortcut. 5. Be transparent about progress towards goals Who you’re hiring and promoting. 6. Endorse the competence of women Vouch for the competence of women leaders in your organisation to help overcome the stereotype that leads us to doubt the capacity of women. The importance of ensuring gender bias doesn’t influence our decisions isn’t so apparent when you view isolated instances. Correll says one instance of a woman’s views not being taken seriously in a meeting will not make a big difference. “But the problem is, the effects of stereotypes accumulate over women’s careers that they serve to carry men and women in quite different directions in the workplace,” she says. Gender stereotypes still live healthy, influential lives in Malaysia. They aren’t restricted to urban areas or old-fashioned domains either, and I confirmed over a recent breakfast with a retired female leader of a well-known, large corporation in Malaysia. We’ve come a long way and that is cause for celebration, but there is further to go. In our efforts to increase the participation of women in the workforce, implementing flexibility at work is one step, but not enough to address the problem. We also need to be aware of subconscious gender stereotypes so that with every choice we make, we are getting the best talent for the job, regardless of gender. This isn’t just for the benefit of women. The same principle applies for males in female-dominated environments. Lily Cheah believes individual differences trump gender stereotypes any day, but admits women need to be more confident and not be held back by traditional notions of what they can or cannot do. She hopes the same for men in traditionally female roles. To discuss this with her, email lily.cheah@leaderonomics.com. Click here for more articles. Next article Are You Riding A Dead Horse?